If you have experienced a breastfeeding bite, you will know that it isn’t pleasant. Most moms worry about their baby biting them during breastfeeding once their teeth begin to develop. However, this isn’t always the case. Naturally, a baby’s tongue will cover their lower gum whilst suckling. Furthermore, your breast will be completely in the baby’s mouth when latched properly. Biting during feeding is your child trying to tell you something. Read on below to see how you can avoid the breastfeeding bite by knowing what to look out for. There are a number of things that could cause your baby to bite you during breastfeeding. Read on below to understand what these are, and how you could prevent them. Don’t Over React If Baby Bites: if the baby is sensitive he may go on a nursing strike say “mommy is not for biting” and don’t sound cross. If Your Child Is Teething: This is one of the most common causes of a breastfeeding bite. Teething can be super sore for your little one. So, keep that in mind. They may try to use your breast as a teething ring. The best way to prevent this is by constant treating your child’s teething. Brush their little gums with a baby toothbrush and cold water. Alternatively, rub their gums with gauze soaked in cold water. This will help alleviate the swelling and possible discomfort. Also, give them an actual teething ring to chew on. as soon as they bite during a feed, remove them from your breast. This will help them associate between feeding time and teething ring bite time. Your Milk Is Too Fast: Sometimes, a breastfeeding bite will happen mid-feed. This could be your baby’s attempt at slowing down your milk flow. If you experience this, attempt lying back a little. This may cause your milk flow to reduce slightly. The speed will then be more manageable for your baby. Don’t Overfeed Your Baby: be sure to remove your baby from your breast the moment he stops drinking. Don’t force nursing if he doesn’t want to nurse. 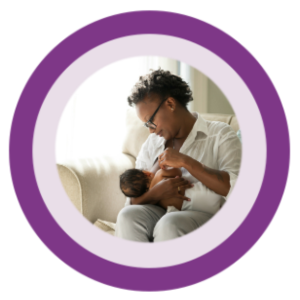 The best way to prevent a breastfeeding bite is to start as soon as you begin to feed. When you feel your child trying to latch down with a gummy bite, remove them from your breast. Sternly tell the “no biting”. Babies are a lot smarter than people give them credit for. They will soon realize that biting equals no more food. This will help curb them chomping down in future. Furthermore, if you see your baby starting to get restless during a feed, don’t try and force them to finish. Show them that you will meet them halfway, and understand that when they are full, you will stop, no biting signals needed. If you are still full after their feed, the best thing to do is express your milk further through a pump. Be sure to do this to avoid discomfort and clogged ducts developing.